The Salt Lake County Health Department (SLCoHD) has issued a Warning Advisory for the Jordan River and its canals after samples showed levels of anatoxin-a that exceed the recreation health-based threshold. Health officials advise people to stay out of the water and keep dogs from entering or drinking river water. Toxins present at this level have not been shown to present a health threat to people kayaking or boating on the surface of the river, but recreationists are advised to avoid areas of scum. 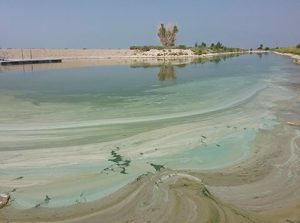 The Utah County Health Department has issued a Warning Advisory for harmful algal blooms (HABs) for all of Utah Lake. 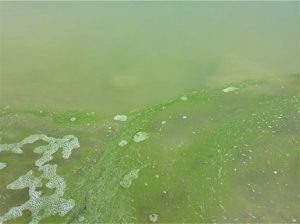 High cyanobacteria cell counts and toxin exceedances at locations on the east and west sides of the lake support satellite imagery showing the bloom is now lakewide. 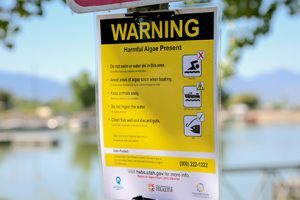 The Utah County Health Department (UCHD) has issued a Warning Advisory for Utah Lake due to toxin levels that exceed health-based thresholds. UCHD advises people, their pets, and other animals to stay out of Provo Bay, Lincoln Marina, Sandy Beach, and the Utah Lake State Park Day Use area.